Produced in Bavaria in the 1950s, this beautiful three-piece dessert set is made of exquisite gold-trimmed ivory china. 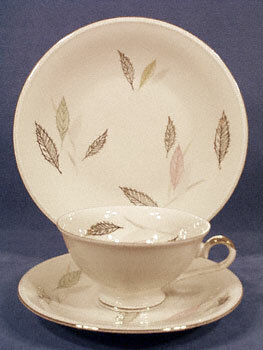 The set includes a 7-5/8" diameter plate, with matching cup and saucer. Dramatically decorated with boldly contrasting leaf patterns in gold, delicate pastels, and "shadows" of soft gray, each piece has a green mark which includes "Bavaria" and the pattern number "4590". Simply perfect in every way for serving life's little pleasures.